There are nearly fifty different pet bunny breeds, so choosing the one that’s right for you can be daunting. When looking for pet bunny breeds, it is best to look for one compatible with your expectations. Does one take easier to rabbit litter training? Is one better for young children? A little research is your best friend when searching for a pet rabbit. Here are ten popular pet bunny breeds. 1. Mini Rex — Rabbit breeders created the Mini Rex through mixing the Netherland Dwarf with the Standard Rex. They are intelligent, energetic and naturally curious and cuddly. 2. Thrianta — Still a comparatively new breed, Thrianta (pronounced tree-an-ta) are attention lovers. Thriantas are small and a soft, reddish brown. 3. Mini Lop — Known for their long ears, mini lops are more quiet than some breeds although they thrive on attention. 4. Netherland Dwarf — One of the smallest pet bunny breeds, Netherland Dwarf rabbits are on average only 1 ½ -2 pounds. Not recommended for small children as they are more skittish and excitable. 5. Harlequin — More colorful in their Japanese variants, Harlequin are usually patterned black and white in the west. On average, they are very curious and love being the center of attention. imitate the silver and black patterning on chinchillas. Slightly large, but easy to groom with a calm personality and hunger for attention. 7. Himalayan — They are distinctively cylindrical in shape, and come in a variety of colors. 8. American Fuzzy Lops — These lops are a long hair breed, and thus require grooming care often. As they age their fur becomes less prone to matting. 9. 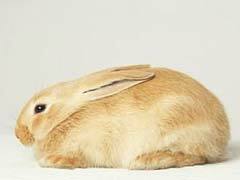 Holland Lop — Another long-eared breed, with a medium coat that needs regular grooming. Can be shy or skittish. 10. Flemish Giant — While not likely to fit in average rabbit hutches, these gentle giants are still wonderful pets. At nearly twenty pounds, they’re closer to medium dogs or large cats, but are sedate and take well to human company.